Preparing for special services is always fun and challenging. Today, Pastor Bob and I met to plan out our Good Friday service. At Journey, our focus is on those who are not now or have never been in a relationship with Jesus, so we don’t usually do a lot of the things that most churches do. For instance, we don’t have Lent or Advent services on Wednesday nights like many churches. One thing that we do, however, is have a service on Good Friday. Traditionally, during Holy Week (the week preceding Easter) churches have a special service on Palm Sunday and then a service on Maundy Thursday and Good Friday. Some of the real die hard’s will even have an Easter Vigil service on Saturday before Easter. We don’t choose to celebrate all those services, not because there’s anything wrong with them, but because we want to simplify people’s lives – not fill their calendars. 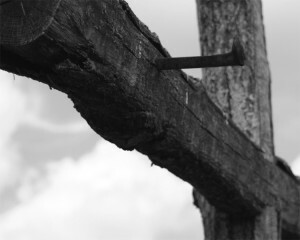 Because of this, we choose to celebrate on Good Friday. Special services like this are a chance to do things that you wouldn’t normally do in the context of your Sunday morning worship. Generally speaking, these services aren’t quite as heavily attended as a weekend service might be, so it’s easier to incorporate some more experiential elements into the worship time. One really cool idea I found (but we’re not using for reasons you’ll see below) was based off of Isaiah 53:5 (By His stripes we are healed). It involved a wooden cross made from a couple of 4×4’s and a bunch of containers of various shades of red paint. At a certain point in the service, everyone comes up and paints a stripe on the cross to symbolize their sins. The photo looked really cool. However, it also looks messy and since we’re renting space for the service, it;s probably not a good idea for us to be throwing red paint around. We’re going a slightly different route using wood and nails – and not exactly how you’re thinking. It’s going to be a creative element that everyone can participate in and will add a powerful focus throughout the service. The experience along with a carefully crafted atmosphere in the room should create a somber and powerful reminder of the price paid for our sins.